My favorite table at my new favorite bar and my better looking Adler Tippa which is very similar to my other one. 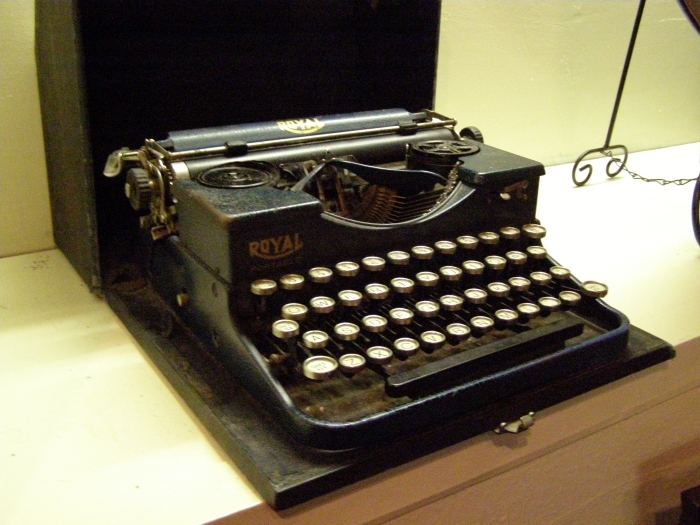 Better picture of the Royal portable in the blog, which the owner got from his son to add to the Royal 10 which is a carriage-shifting single-pane machine the owner won at an auction for $7 which has been part of the decor since. I got the Benson which is their standard Italian except it wasn't standard, it was exceptional; and a footlong plus drink, plus chips, plus cookie, was only $10. If you get a six inch it's more like $6-$7 and there are specials everyday. The Royal I absolutely love. I would steal it but the guilt would consume me and I would hear the click and clack of typebars in the night like in Poe's "Tell Tale Heart". 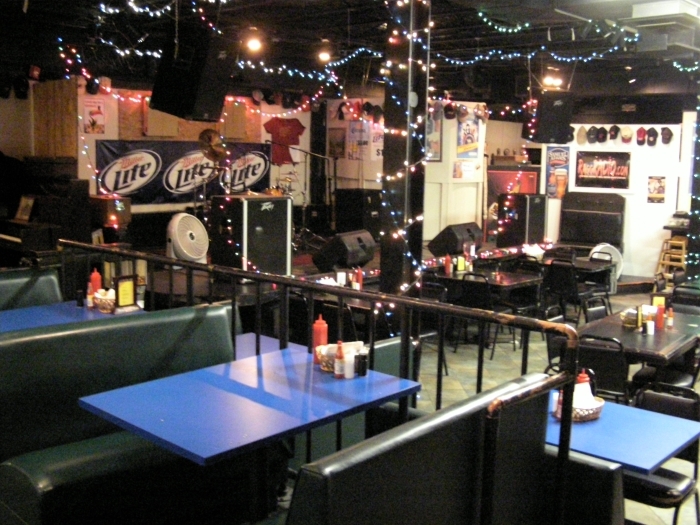 A very cool stage that looks better not on my camera big enough for most bands and such that any seat is a great seat. 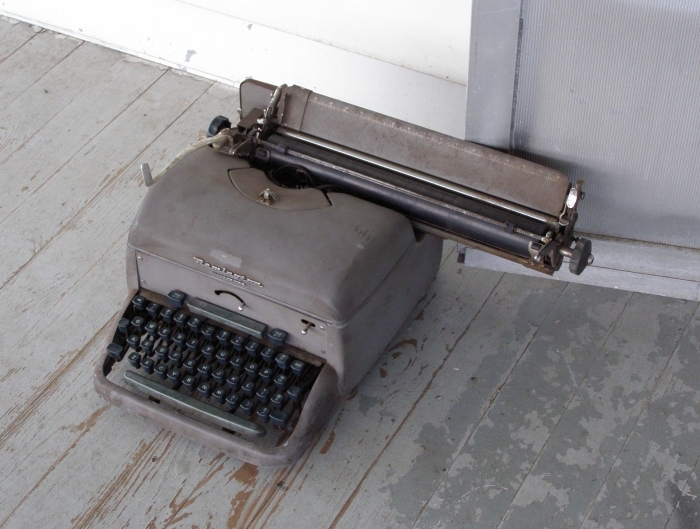 The Noiseless was just too cool to throw away, and I would never throw away a typewriter, but I didn't want it. Glad it found a new home where it can be appreciated. Clever but crude use of a typewriter. Complex Noiseless mechanism. It actually looks pretty good, which made me optimistic about restoration. Crappy rubber parts, which made me pessimistic about restoration. Maybe someday, this machine's story is not over, who knows where it might end up next. That Remington has real potential.... I'd love one myself. Love your shots too... and your tale. It has some potential. The rubber is hard as rocks, everything is stiff, and the patina is a little thick. 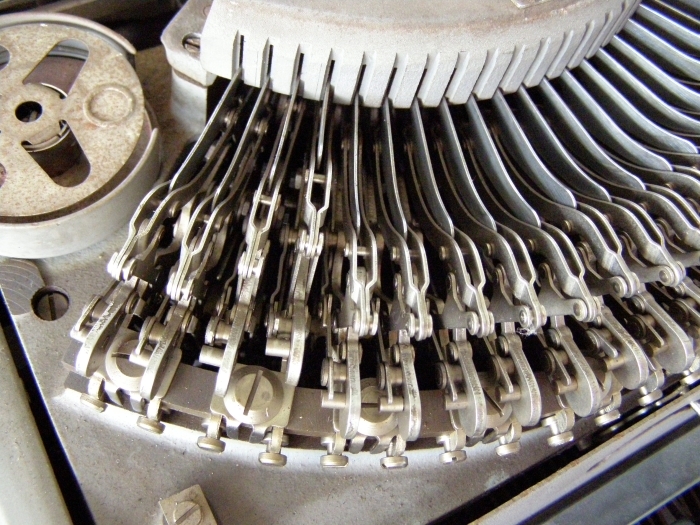 I have many other better and easier typewriters to work on. At least it will be preserved until future restoration if that happens. Well, I'd offer to buy it from you... but I'm soooooo far away, that I'm not sure it would be practical. But either way, the rubber can be sorted with a little effort, and I think that machine would be a brilliant candidate for a re-paint. I would have happy sold it. What little effort is there in platen recovering? 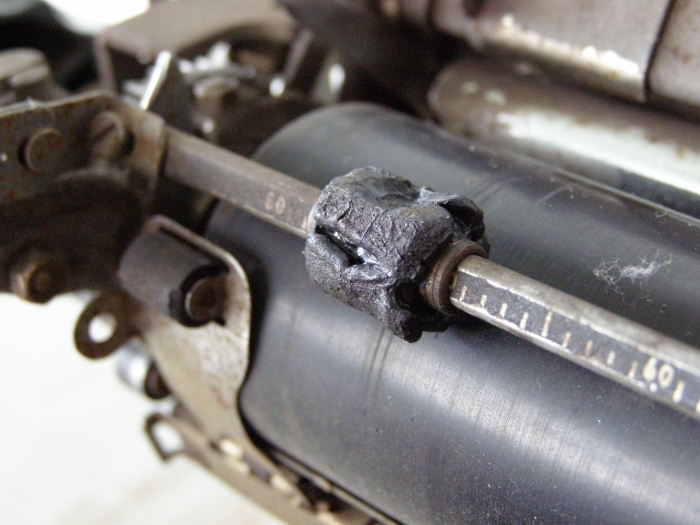 You'd practically need a diamond to scratch this platen, and everything else was rot, needed replacing, not refreshing. My picture makes those paper bail rollers look soft and chewed up but they are hard as rocks too! I estimate it would take at least $125 to replace all the rubber and get the platen resurfaced and I just don't think it is worth it yet. Someday this machine will be more rare and it will be, but that is a long way away. Both me and my friend were enticed by it as you are, and both of us gave up on it after having it sit around a few months. I would have happy sold it? I would have HAPPILY sold it. I guess blog comments are like typewriters, after a certain point you cannot fix it and you have to let it be. But then again.... I'm now getting quite hungry looking at your post again. I think I'll go and cook some dinner. The guy who gave you the Remington sounds like a real character. 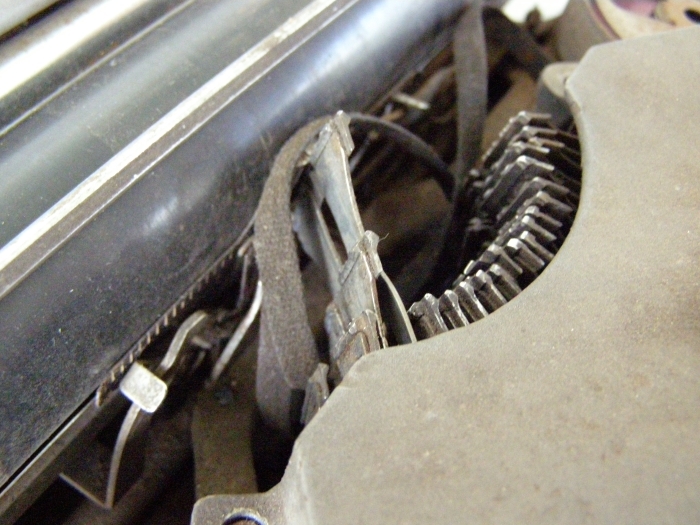 What is it about typewriters? They not only write stories, but possess that elusive quality known as Narrative Attraction. Such a nice looking Tippa, I must get one someday. I am shocked you don't have one! It's the lightest portable made, or so I have heard, and it isn't too rare. A master list would be cool. I'm guessing all but a few places are typist friendly. The only valid complaint is the noise and most places have enough music or conversation it's not a problem. Looks like a great place to type. If I still lived in Hardy I'd type-in. The Remington looks quite interesting. I really like the typeface on your Tippa. Thanks for the compliment on the Tippa typeface. I never thought of it as special, but I love the clarity of it. This place looks so amazing! The next time I am anywhere near Virginia, we will have to organize a type-in. 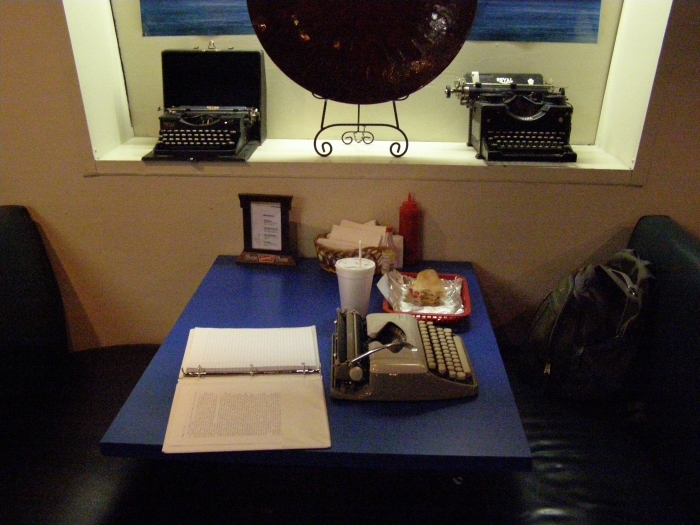 Great food, booze, typewriters and friendly conversation? By god, count me in! Let me know, I'm dead serious. 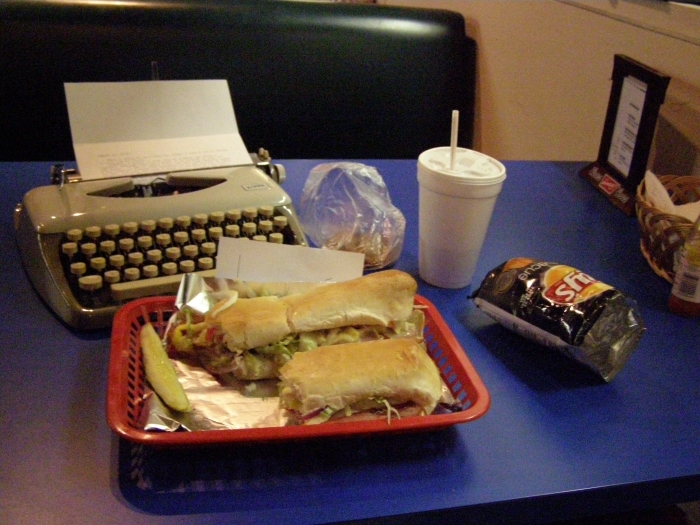 I will meet anyone there who wants to grab a bite and type a little. 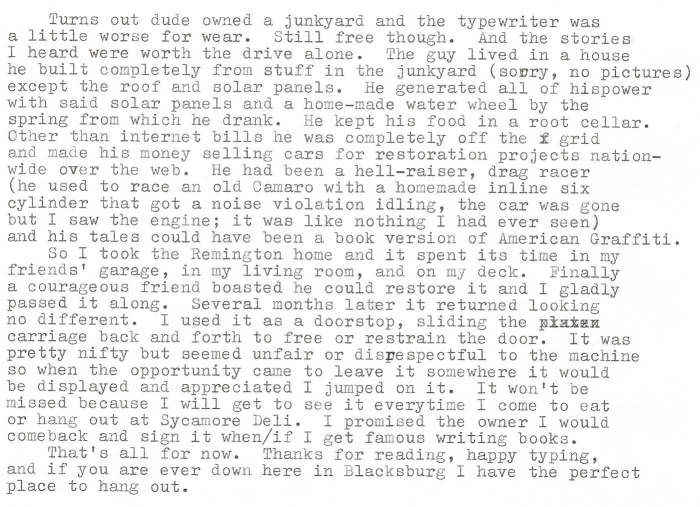 Ah public typing, discovering a new venue and restaurant, and a typewriter adventure: perfect blog entry! Thank you! It was a perfect weekend. 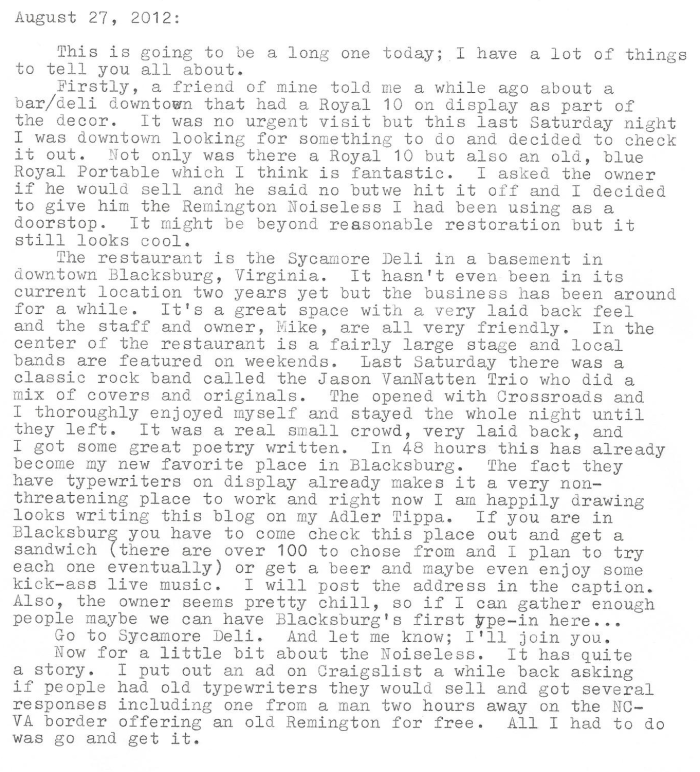 Maybe someday I can top this entry by meeting a fellow Typospherian in person at said venue while also public typing... Next time any of you are swinging through Blacksburg hit me up!